Fi system is provided with fail-safe function to allow the engine to start and the motorcycle to run in a minimum performance necessary even under malfunction condition. The engine can start and can run even if the signal in the table is not received from each sensor. But, the engine running condition is not complete, providing only emergency help (by fail-safe circuit). In this case, it is necessary to bring the motorcycle to the workshop for complete repair. 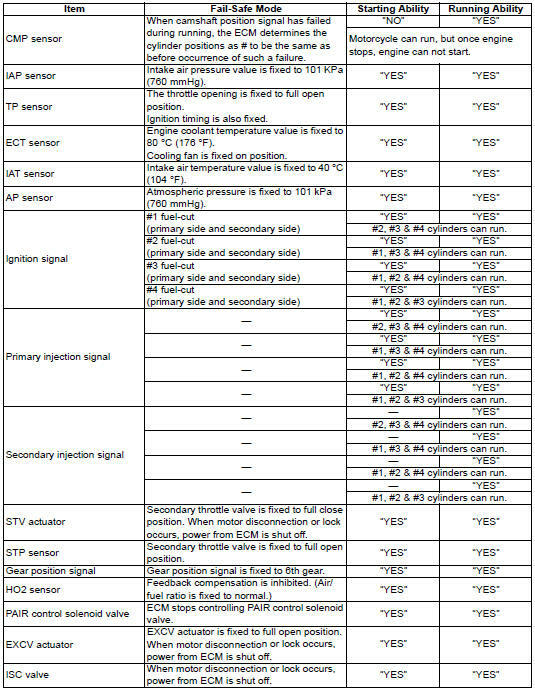 When two ignition signals or two injector signals are not received by ecm, the fail-safe circuit can not work and ignition or injection is stopped.